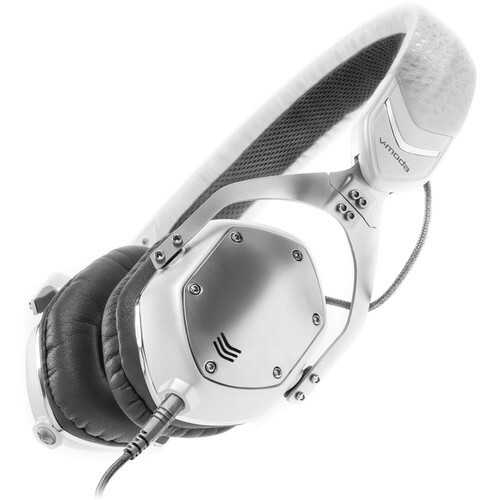 The white silver V-MODA XS Headphones feature 40 mm dual-diaphragm drivers and an isolating on-ear design for a quality listening experience even in noisy environments. They also feature dual 1/8" audio jacks for daisy chaining headphones, and an ergonomic SteelFlex headband with soft memory foam ear cushions for a snug, comfortable fit even during long listening sessions. The XS headphones also feature a collapsible design and come with a hard carrying case for convenient storage and transport. The microphone on the detachable SpeakEasy cable has been tuned for voice recognition and calls in noisy places. Furthermore, the cable has been reinforced with Kevlar for durability and maximum strain relief. Box Dimensions (LxWxH) 9.3 x 5.4 x 3.4"
XS On-Ear Headphones (White Silver) is rated 5.0 out of 5 by 1.